A robotic pack mule being developed for the Pentagon by Boston Dynamics could give U.S. troops a leg up in terrain too rough even for military vehicles. The mechanized four-legged robot, capable of carrying all the gear soldiers and Marines might need in combat, still faces two years of on-the-ground testing, but it appears to be the high-tech equivalent of the pack mule that the Defense Advanced Research Projects Agency, or DARPA, has been looking for. "A legged robot can unburden dismounted squad members by carrying their gear, autonomously following them through rugged terrain, and interpreting verbal and visual commands," DARPA said in a release about the project. 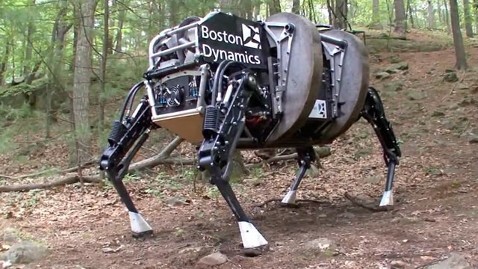 "Most of the earth is inaccessible to vehicles, wheeled or track," said Marc Raibert, the president of Boston Dynamics, "but the animal kingdom can go anywhere with legs. So the idea is to go anywhere animals can go." Raibert's company has been working for the last few years on DARPA's goal and has had success with its biologically inspired robots. Two years ago the company came up with an initial robot design known as "Big Dog," which became an Internet video favorite a few years ago. That 250-pound robot, whose initial design was eight years in the making, could be seen balancing its way through parking lots and hills while carrying a 100-pound load. Most surprising was how the robot was able to maintain its balance even when pushed aside by a tester. Based on that success, DARPA and the Marine Corps awarded Boston Dynamics a $32 million contract to come up with a bigger and more agile robot capable of carrying a heavier load than the original. The new robot, called the Legged Support System, or LS3, weighs in at 800 pounds and is capable of carrying 400 pounds of cargo for 20 miles. Two completed prototypes have much quieter engines than the earlier design, new gaits and improved sensory perception. That's because Raibert says it's not just about replicating an animal's legs, but its smarts, too. The LS3 has a camera sensor system that provides the "eyes" it needs to make smart decisions about where it should go on a wild terrain. "Ears" for the LS3 are also on the way, so the robot can to respond to simple commands. The robotic pack mules will now undergo two more years of field testing with the military that will be topped off with a Marine Corps Advanced Warfighting Experiment where the LS3 will be embedded with a Marine squad for an operational exercise. "We've refined the LS3 platform and have begun field testing against requirements of the Marine Corps," said Army Lt. Col. Joe Hitt, DARPA program manager. "The vision for LS3 is to combine the capabilities of a pack mule with the intelligence of a trained animal." Rainert said he is confident that the robotic pack mules might one day be used by combat troops. He also doesn't think it's a big stretch to imagine robots becoming man's best friend of the future. "Look at how attached people are to their cell phones," Raibert said. "People can easily get attached to technology and I don't see why they can't get attached to this." It's not the only biologically inspired robot design from Raibert's company that has caught the public's fancy. Last week the company released video of its " cheetah" robot, which like its namesake is designed for speed. During recent testing it reached a top speed of 28 mph - not exactly up to pace with a real cheetah, but faster than Jamaican sprinter Usain Bolt's fastest 20-meter split of 27.8 seconds. Quite an accomplishment given that most robots can only reach top speeds of 10 mph.